Everton fans are no doubt crying out for the club to sign a striker in the summer transfer window after their woes up front this season. Cenk Tosun has been far from the standard required to thrive in the Premier League, Dominic Calvert-Lewin lacks the experience to bare the burden on his own, while Richarlison is not even a natural forward but has been played there anywhere. 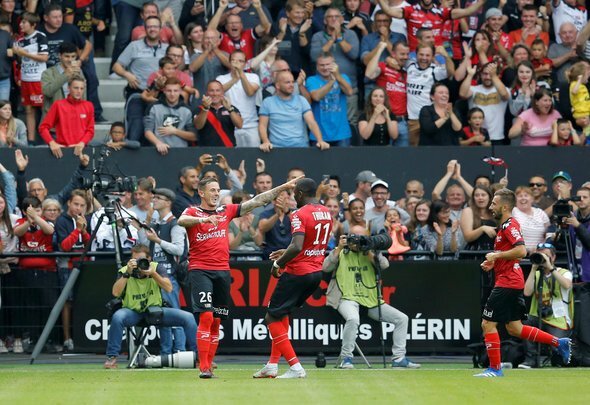 It would have baffled many Toffees supporters why the club did not rectify the issue in January, but they can now redeem themselves by signing red-hot Guingamp striker Marcus Thuram in the summer. He was on the radar of Newcastle last month according to Team Talk, but it should be Everton who gets his signature in the summer, as he could turn their fortunes around in an instant. The 21-year-old has scored 11 times in 23 games for the Ligue 1 side this term, which is a promising figure for a forward of his age, but what is clearly evident is that he has an eye for goal. Everton have lacked this sort of player ever since Romelu Lukaku left Goodison Park, so it is about time they signed someone who they can rely on to deliver the goods on a regular basis. The club would be mad if they did not sign an attacker in a few months’ time, but it looks like Thuram could be the perfect fit for them. He is known to be versatile as he is effective too, as the young ace is able to play up front as well as being able to operate on the wing on occasions. Thuram is dangerous on the counter attack, and his speed will no doubt prove very useful playing in the high intensity of the Premier League. Many Everton fans would drool if the club completed a summer swoop for the hot-prospect, as he is definitely Silva’s ideal signing.